Since Disney seems to be a big part of my world right now – some part my kids’ daily entertainment – future vacation plans, etc, I decided to just lay it all on the line and freely fly my Disney freak flag. There, I said it. I am in love with Walt Disney World. I waste too much time googling and pinning all things Disney, like money saving tips, ways to surprise your kids with the news that they’re going, how to manage that LONG car ride with pre-schoolers, etc. I finally took it upon myself to follow through with something that caught my eye. 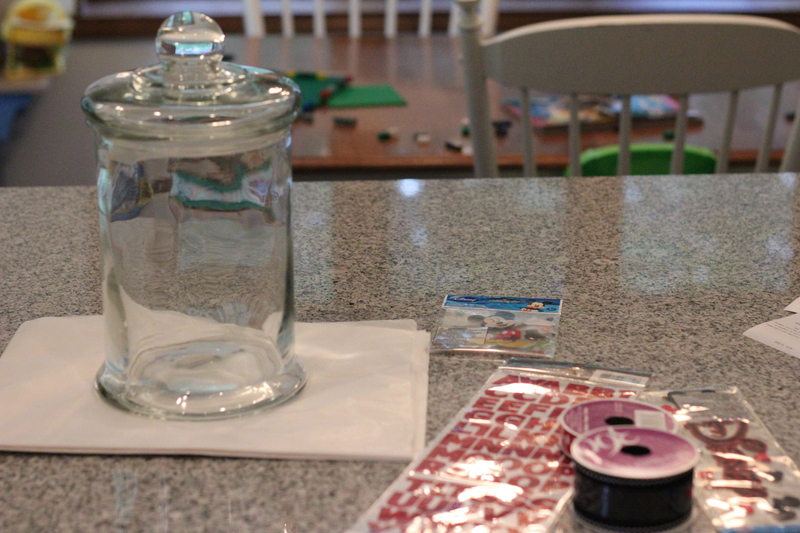 One of the money-saving tips was to create a cute jar and throw your pocket change into it at the end of each day. Or dollar bills. Or Disney gift cards that you just happened to pick up at Target. Or you know, maybe your friends visit and want to empty their pockets in the jar. The idea isn’t necessarily that you will save up enough money for the entire trip, but maybe enough to pay for your food or some souvenirs. Regardless, it’s a fun way to keep a daily reminder that a Disney trip is in the future (however near or far) and to set some spare money aside when possible. 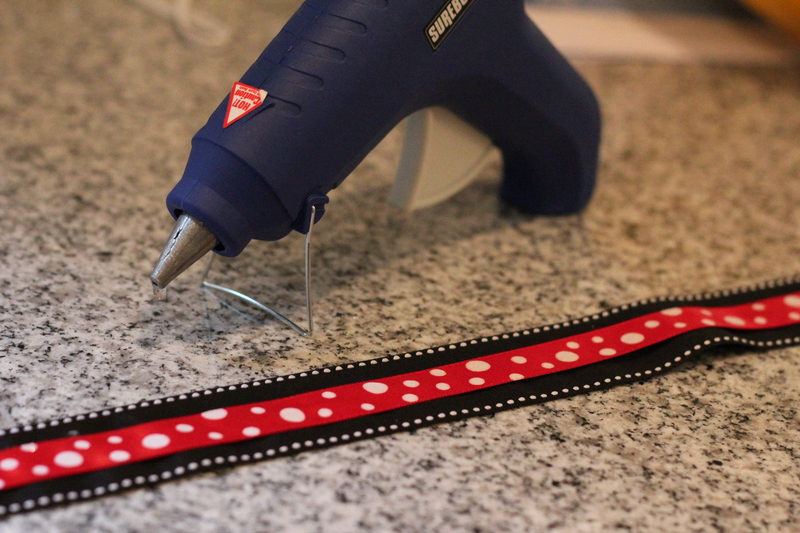 My Disney-loving cousin visited this weekend so I had her school me in the ways of the hot glue gun (I’d never used one before). 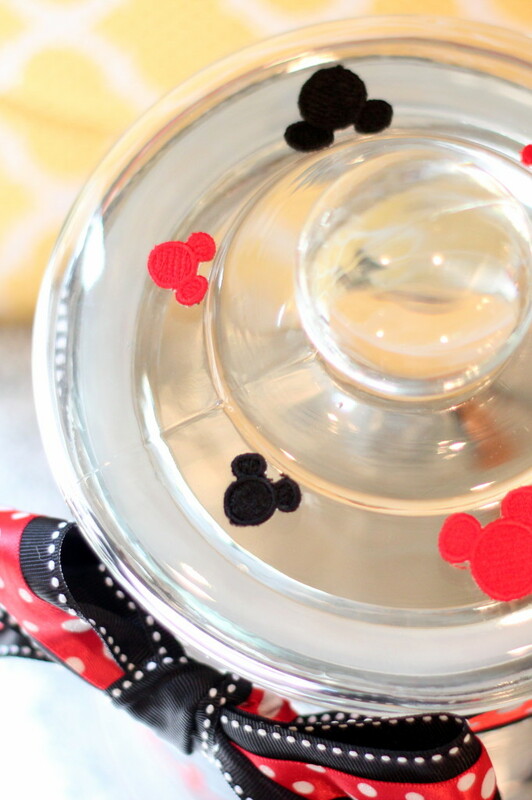 I think the jar turned out cute – and I bet she’ll be making one of her own soon 😉 …thank you Cousin Kara! I purchased everything at the craft store. 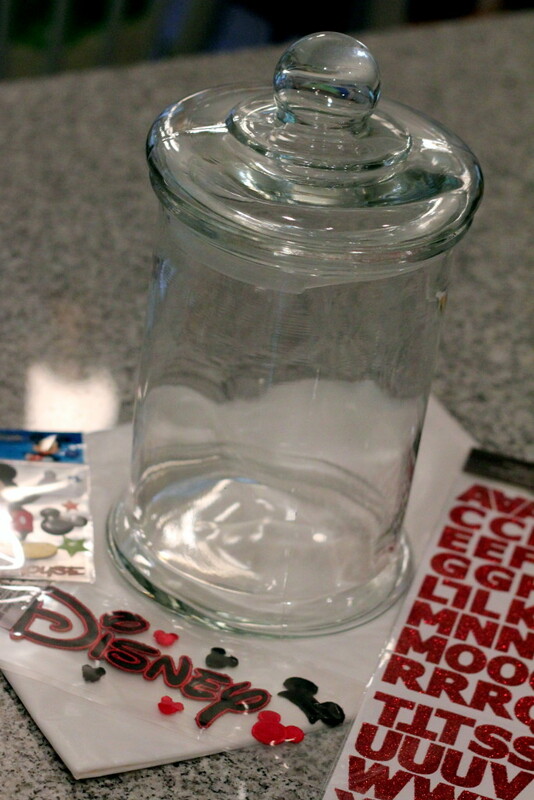 A glass jar with lid, ribbon, and Disney stickers. Luckily Michael’s had TONS of Disney/Walt Disney World stuff in their scrap-booking section. I thought we’d have a hard time choosing a font that looked most like Disney but instead, the problem was deciding which Mickey/Disney stickers would work best on the jar’s shape. Easy Peasy. 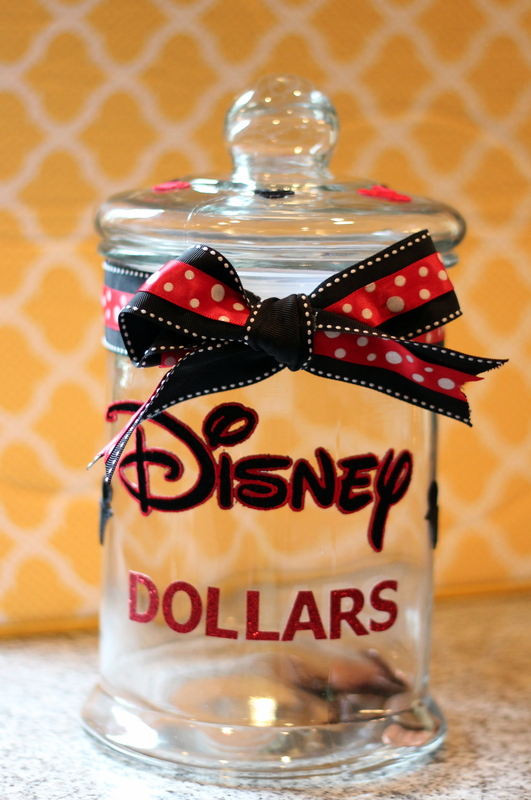 Glued two ribbons together to give the savings jar a more festive Disney look. Settled on glittery red letters for the word “dollars.” We ended up not using/needing the Mickey sticker that you can kind of see in the photos above so he’ll be going back to the store. Hey, $4 is $4! That’s $4 that can go in the jar! Cute Jar!! I hope you saved enough and have taken your magical vacation!